I buy things from Dover -- they often have unique items and a great selection. Their customer service is good. Their shipping fees used to drive me bananas, but they changed their policies recently to make the shipping fees correspond better with the actual shipping cost. What do I not get about Dover? Their sales, and more generally, their prices. This image appeared in their most recent spring sale catalog, and it is listed as an inventory closeout. The price, almost $120, is $20 more than what I paid for the item from Smartpak last fall when it was first introduced. Closeout pricing? Hardly. I priced this item from a lot of sources last fall, and not one was over $110 with tax. Hey guys at Dover -- was this a mistake? I love Dover but I still hate their shipping costs. I recently bought myself a new pair of boots and a couple other things. The combined total cost was over $300. Then I had to pay THIRTY DOLLARS for shipping because they base their shipping cost on dollars spent, not weight! I thought I should qualify for free shipping at that cost; that's what most other companies do. I had a Dover gift card, or I would have bought the boots from Smartpak - they were the same price. I think, sometimes, there's a little of that "upscale" sense at Dover. IF they are classy, they can charge more. People who don't know any better do not shop around for better prices. It's not true of everything there, however, because sometimes their sales prices really are a deal. I always think people know how to do an Internet search for deals and such, but that doesn't seem to be true. So, they go to Dover, knowing they're likely to find what they want and then simply pay the price. I quit buying from Dover because of their shipping. Their customer service was great and I would buy again, but not if I can get the item someplace else. As for pricing, no one store can have the lowest prices on everything, they would go out of business. They have to make money where they can. Even Smart Pak isn't cheapest on everything. 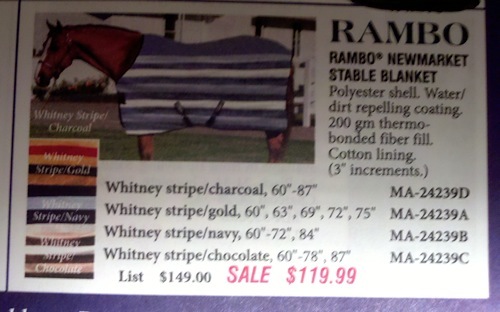 Well, I paid $129.95 for the same blanket on Aug 26, 2010 from SmartPak. So I guess for me, $119 is cheaper, though I'd hardly define it as closeout. That said, I do find Dover equal pricing or better on many items I buy. And sometimes their closeout prices are really good (like apparel). I never look at the paper catalog. I also wish they had flat fee shipping with extra shipping on randomly heavy items perhaps. I bet I'm not in the minority when I confess I look at Dover then buy the same elsewhere for less. I love browsing (drooling over) Dover's catalog but I've never ordered from them. I find they are almost always more expensive than other retailers. I bought my blankets from Schneiders and have purchased a few odds and ends from State Line Tack. I've also decided to try to buy as much from local businesses as possible. I've never been a huge fan of Dover, just because of their shipping. I am a die-hard UPS fan because you can get just about anything just about anywhere in about two days, despite the weight or number of items shipped. FedEx, Dover's shipping company, takes at least a week to get anything anywhere. My most recent purchase from Dover was two hairnets - a half pound package which cost more to ship than to actually buy. And when it did ship, it took over a week to get it to me. I'm sorry, but that's flat out ridiculous. It would've been faster just to put them in an envelope and stick them in mail servicee. If SmartPak had a selection anywhere near Dover's I wouldn't even buy anything from Dover simply because SmartPak's shipping is a thousand times better than Dover's. @Stacey Kimmel: Also, my total bill was $545.23 and my shipping was also $7.95 - so I guess that's pretty good. I didn't have promo pricing. I have had good luck with Dover, but I do not satisfy all of my horse-related purchases there. Like jump blocks, expensive anywhere, really expensive from Dover. 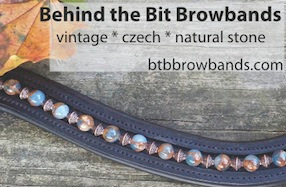 The company that burned the bridge for me was State Line Tack. Before I was a horse owner, I used to buy clothing from them. I once waited six months for paddock boots. I called about the shipment and was told they were on back order, over and over again. I probably should have canceled the payment and ordered elsewhere, but I was a college student and needed the cheapest black paddock boots that I could find. That was my last purchase from State Line; Dover has always been reliable and with quick delivery as is Valley Vet and Star Ridge Natural Horsecare. Hmm, interesting. I just paid $115 (plus 12% tax) for a Newmarket Cooler here in Canada, I thought that was a good deal-- but 99$, thats great! Did you buy the stable blanket or the fleece dress sheet? The dress sheet runs around $99, the blanket looks to have been running in the $129-139 range. The Dover ad features the stable blanket. I've always been die HArd Dover, I never really noticed the shipping. I'm also not a fan of STL. BUT i istill always go to Ebay first before buying Dover. Great article. I like your post. I will keep visiting this blog very often. It is good to see you verbalize from the heart and your clarity on this important subject on trees can be easily observed.